Why clean these dirty, smelly, infected ears? Don’t worry, ear problems are extremely common in cats, but they commonly are misunderstood by even the most experienced cat owners. Some might even ask “why clean my Archibald’s ears?” Others might have let their cat get an ear infection or ear mites already. Almost every single cat will suffer from an ear infection or ear mites at some point. You might have noticed Tigger is constantly scratching or shaking her head, has excess wax and dirt, or has a foul odor coming from her ears. Infections can be very painful to old Mrs. Bigsby, even if she doesn’t show it. If she does show it, most of the treatments available are full of chemicals, expensive, or just don’t work. Once we realized that there was a problem, that’s when we got to work. There must be a safer, more natural solution to preventing and treating painful ear infections and mites. But what causes ear problems? Ear infections, or otitis, is mainly caused by bacteria in the middle or inner part of the ear. Cats that have genetic predispositions or a supressed immune system can increase the likelihood of Oreo getting an infection. Ear mites on the other hand are parasites that are highly contagious and pass between animals during contact much like lice. Mites are extremely common in neglected cat ears. Follow these instructions to give little Bella the most relaxing and effective ear cleaning she’s ever had. About 5 minutes. If Monseigneur Snubbles doesn’t like or has never had ear cleaning, you might need some more time. Petpost Pet Ear Cleaner Wipes? Petpost Cat Ear Wipes are presoaked in a natural blend of plant-oils-and-nothing-else, which gives each pad a uniquely gentle power. So far, though, we haven’t figured out a way for your cat to clean their own ears. The gentle formula of Petpost Premium Cat Ear Cleaner cleans ears most effectively in the hands of an equally gentle person. To help your Jelly Dumpling get adjusted to ear cleanings, bring him where you plan to administer the cleanings and let him investigate its fresh scent. Give treats and, of course, vigorous ear rubs. After three or four sessions, just the sound of the Petpost jar twisting open will have him running to you. Gently shake the jar of wipes to make sure that all of the pads are equally wet. Lift Pupernickel’s ear and gently begin wiping the ear. Be careful, tissues inside the ear easily damage, so don’t play rough. Start with the outside of the ear, and work your way in. Be careful not to push wax further into your cat’s ear canal – you are trying to get the bad stuff out, not push it further in. Oh, and if Polkadot tells you to stop you should listen while he’s still asking nicely. Use a dry cotton pad or three to soak up any excess liquid and clean up any remaining goop. Do the other ear. Did you forget there were two ears? Repeat daily until wax build-up and odors significantly decrease. This takes 2-5 days, depending on cat size and ear floppiness. Make cleanings part of your weekly routine—not your annual routine. Mr. Pickle will show his thanks in the form of purrs and hand licks. If after your first cleaning you notice that your cat has alot of ear junk deep inside the ear canal, you should give our 8oz Liquid Cat Ear Cleaner a try. It’s perfect for blasting out dirt and mites from the abyss. Always clean Jasper’s ears after he’s gone out in the mud or done anything extremely dirty. Dirt in the ear makes all kinds of nasty things grow. 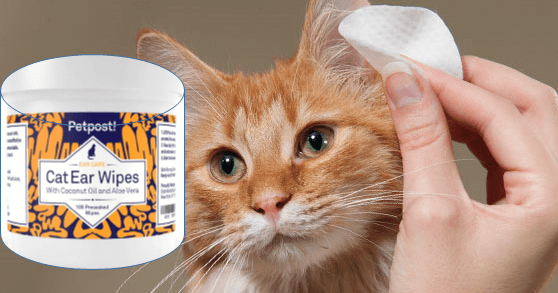 The Petpost Cat Ear Wipes wash that nastiness out. Only cotton pads are cotton pads. Cotton swabs are not. Don’t use them. Just don’t. The ingredients in this product are Naturally Derived Coconut & Palm Extracts with Aloe (Water, Disodium Coco-Glucoside Citrate, Aloe Leaf Juice, Glycerin, Coconut Oil and Fragrance) as well as Phenoxyethanol which is most commonly found in Green Tea, but also works great as a safe preservative to keep bacteria and other nasty stuff away! I will have to try these for my girl. So far we have only used the prescription wipes from the vet. They are ridiculously expensive! I was hoping to find a good alternative that is more affordable and doesn’t need a prescription. Thanks for sharing this. Do you use them often?